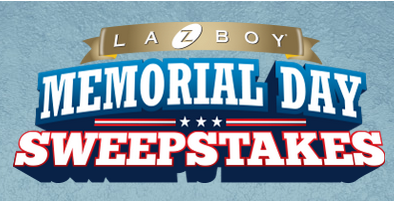 La-Z-Boy Memorial Day Sweepstakes – Win a $500 La-Z-Boy gift certificate! Win a $500 La-Z-Boy gift certificate! ELIGIBILITY – “La-Z-Boy Memorial Day Sweepstakes” is open only to legal residents of the fifty (50) United States (and the District of Columbia) and Canada (excluding Quebec), who are at least eighteen (18) years old at the time of entry. SWEEPSTAKES PERIOD – The Sweepstakes begins on 05/13/2014, at 12:00:00 a.m. Eastern Time (“ET”) and ends on 06/02/2014, at 11:59:59 p.m. ET. PRIZES – ONE (1) GRAND PRIZE: A $500 La-Z-Boy Furniture gift certificate for use toward furniture of the winner’s choice at a La-Z-Boy Furniture Galleries location.